You might not even be aware of what the transmission is but it is a vital part of your Go-kart. Most karts have a relatively simple transmission system, which consists of just a few gears that are able to control the speed. All engines have a rev limit that they cannot go past without the engine exploding. This is known as the “redline”. The transmission allows you to change gears so that the gear ratio between the engine and drive wheels alters as you accelerate or slow down. This allows the engine to stay below the “redline”, whilst still keeping to the optimum revs per minute (rpm). Go-karts do not generally have a differential, which is a device that is usually made up of different gears, allowing the wheels to rotate at various speeds, whilst delivering a “rotational force” to them. Without a differential, a kart isn’t able to make a sharp turn. To counteract this, one of the rear tyres needs to be able to slide whilst you go through a corner. This is often done by constructing the chassis so that the inside rear tyre can lift up slightly when you turn into a corner. This lets the tyre lose a little bit of its grip so that it can go through the corner safely and slide if necessary. Power is put out by the engine and delivered to the rear axle via a chain. Most of the early karts were direct drive, but modern karts tend to have a clutch. The clutch became a key part of many karting classes including the Rotax Max karting class, and from January 2007 onwards, the use of the clutch has become mandatory. This is because of the move to using 125 cc engines in karting classes, which all come complete with a centrifugal clutch. Shifter karts are popular in the US. These have a six-speed manual transmission and a clutch, both of which are designed to get the most out of the engine. 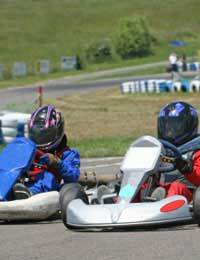 In the UK (and elsewhere in Europe), karts with 100 cc and 125 cc engines are the preferred type of karts, although 125 cc, 210 cc and 250 cc shifter karts are also used in certain karting categories. With a manual transmission system, you have to learn when it’s necessary to change gears, and remember to do so - the kart will not do this for you! This can be difficult to get to grips with at first, and when you first start karting, it’s easy to feel like you’ll never be able to do it. Once you get the hang of it though, you’ll wonder why you were so worried. The transmission plays a key role in maintaining the most possible rpm, whilst also making sure that the engine is not allowed to overheat and ultimately explode. Getting used to changing gears manually takes lots of time and practice, and it can be frustrating at first. It will become easier over time though, and at some point, it will become second nature. Is Gokart transmission system having clutches and gears ? Than how gears system is used without mounting differential gear box ? how to done the calculation of discover 125cc dtsi engine for go kart? Can gearless transmission systems are used in karts? Is CVT transmission is suitable for go karts??? If yes why??? And please me will it be better than other transmission systems or not?? ?